Whenever LUPEC throws a party I find myself gleefully overwhelmed: So many cocktails on offer, so little time…however will I sample all of the delicious drinks on this list in one evening? Perhaps I’d try if I were a guest, but since I’m there representing a ladies club devoted to sophisticated and responsible imbibing, I abstain, lest I end up dancing on a table with a lampshade on my head. But what about all those cocktails I missed out on? Now, thanks the the recently available Little Black Book of Cocktails by LUPEC Boston, many of those drinks can be made in the comfort of your own home. Handsomely designed by LUPEC Boston’s own Pinky Gonzales, this smart little book contains recipes for all ten of the “namesake cocktails” of the ladies of LUPEC Boston, plus recipes for some of our favorite classics and vintage-inspired originals — approximately 40 favorites in all. We’ve designed it with readers like you in mind, so you may enjoy these fine drinks at home, on your own time — lampshade chapeau-ed dance optional. The book costs $15 and all proceeds from book sales benefit the Friends Boutique at the Dana-Farber Cancer Institute, which provides wigs, prosthetics, scarves and services for people dealing with the appearance side effects of cancer treatment. 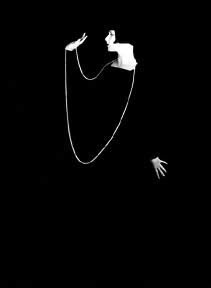 And his images, in turn, became the cornerstone of The Little Black Book of Cocktails by LUPEC Boston. 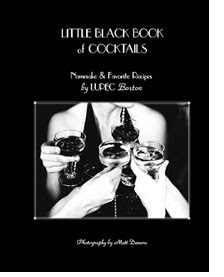 To order a copy of The Little Black Book of Cocktails email us at lupecboston@gmail.com. You can also pick up a copy at Magpie (617-623-3330) in Davis Square, Somerville, or Buckaroo’s Mercantile (617-492-4792) in Central Square, Cambridge. And let us know what you think of the drinks by dropping us a note in the comments section. The first reader to respond letting us know they’ve tried all ten cocktails just might receive a special prize at our next event!